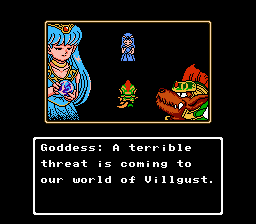 Armed Dragon Fantasy Villgust is an action role playing game for the Nintendo Entertainment System. 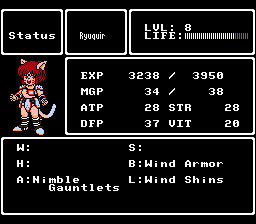 Its a side story of the Super Nintendo game Kouryuu Densetsu Villgust: Kieta Shoujo. 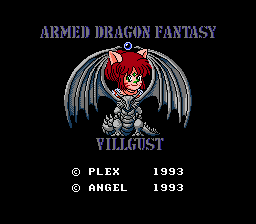 This is a retranslation of Kouryuu Densetsu Villgust Gaiden, also known as Armored Dragon Legend Villgust or Armed Fantasy Dragon Villgust. 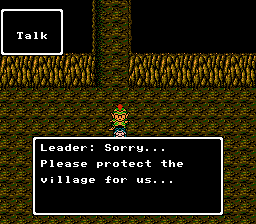 At some point a discussion concerning old, inaccurate/problematic patches took place between the authors, and this game came up as an obvious candidate for retranslation. 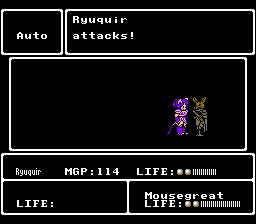 It’s a spin-off/prequel to the events of the manga/OVA. The whole franchise is based on a series of toys, and it still has some following even today. The patch should be an improvement over the old one in every way, with everything translated. If there are any questions concerning the translation, the authors can be reached via RHDN/Discord.